Huntington's disease is an incurable and fatal neurodegenerative disorder characterized by movement problems and a variety of other symptoms. It is a rare example of a neurological disorder that can be traced back to a mutation in a single gene. In this video, I discuss the symptoms and pathology of Huntington's disease. George Huntington was not a prolific researcher. In fact, he only published three scientific papers in his career. The first of these, however, published in 1872 when Huntington was just 22 years old, would lead to his name being found in most neuroscience textbooks today. In that paper, titled On chorea, Huntington discussed a disorder called chorea that had been known since the Middle Ages. The word chorea comes from the Geek word choreia, which means to dance, and it was used to describe a disorder characterized by involuntary, spasmodic movements of the limbs that bore some resemblance to an odd dance. There are a number of different types of chorea, each linked to a different underlying cause. George Huntington wrote the best description to that point of a particular form of chorea that began in adulthood and was inherited, inexorably progressive, and always fatal. Within a few decades, the chorea Huntington described was widely-recognized as a unique disorder, which---in appreciation for Huntington's clear and accurate depiction of the disease---was called Huntington's chorea. The name was eventually changed to Huntington's disease (HD), as it became apparent that the condition involved more than just chorea. Not all patients with HD develop chorea and even those who do experience a number of other symptoms that are not related to movement. In the 20th century, the hereditary nature of HD became even clearer as our understanding of common patterns of inheritance improved. In the 1980s, a gene was identified that seemed to be the cause of HD. With this discovery, HD joined a short list of diseases caused by the mutation of a single gene. The symptoms of HD can appear at any age, but typically emerge in middle age (the average age of onset is 40 years). At first, patients will often experience subtle changes in personality, cognition, and movement. For example, a patient might become irritable, have trouble remembering things, or be especially restless or fidgety. These symptoms, however, are usually not enough to lead to a diagnosis. The early symptoms then progress into symptoms that allow for a clear diagnosis of HD. These include: conspicuous movement problems like chorea, impaired coordination and balance, abnormal eye movements, and muscle rigidity. Also, cognitive symptoms can become debilitating, and can involve difficulty focusing, a tendency to become fixated on a thought, lack of impulse control, and lack of awareness. Psychiatric symptoms like depression, insomnia, and fatigue are common as well. 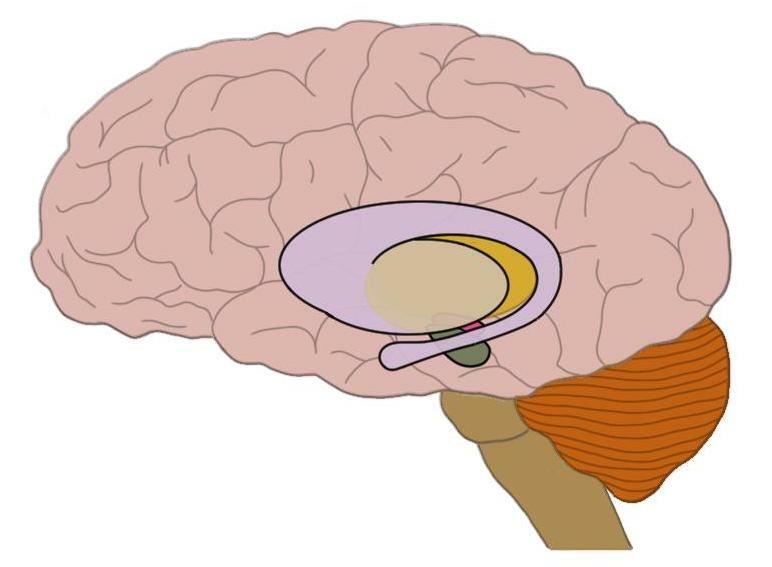 huntington's disease causes significant neurodegeneration in the basal ganglia (highlighted structures here in the middle of the brain). HD is a neurodegenerative disorder, meaning it is characterized by the degeneration and death of neurons. Thus, symptoms are accompanied by pathological changes to the brain, including neuronal loss in specific brain regions. The caudate and putamen (both part of the basal ganglia) are the two areas where cell loss is the most prominent, and damage to them is thought to be the cause of some of the movement problems HD patients experience. Other areas of the brain, however, like the substantia nigra, cerebral cortex, hippocampus, cerebellum, hypothalamus, and thalamus are also affected. The disease is invariably fatal; the average time from diagnosis to death is around 20 years. HD is a rare disorder, occurring in the western world at a rate of about 4-10 cases per every 100,000 people. As mentioned above, the disease is inherited, and can be traced back to a mutation in a single gene called huntingtin (HTT). The HTT gene contains a DNA sequence that consists of three nucleotides (cytosine, adenosine, and guanine, or CAG) in repetition---a pattern known as a trinucleotide repeat. Some degree of trinucleotide repetition in the HTT gene is normal and will not result in HD. When the gene is mutated, however, excess CAG repeats (above 35) can occur. The higher the number of repeats, the greater the risk of developing HD. For example, 36-39 repeats leads to an increased risk of HD, but also the possibility that the onset of the disease will be so late in life that noticeable symptoms may not appear before death due to other causes. 40 or more repeats, however, is a fully penetrant mutation, meaning that all people with the mutation will develop disease. As the number of repeats increases, the age of onset is more likely to be younger, with 70 or more repeats causing the disease to appear during youth. The largest repeat length seen so far has been 250, but it is very uncommon to see repeat lengths greater than 80. The mutation in the HTT gene that leads to HD is known as an autosomal dominant mutation. This means that the gene variation that encodes for the mutant protein is dominant, and will be expressed if it's inherited. If one parent has HD, their child has a 50% chance of inheriting the mutated gene, and thus of developing HD. The function of the huntingtin protein (which is produced by the HTT gene) is not fully understood, but it is thought to play important roles in embryonic development. There are also indications it is an important regulator of signaling pathways in the cell. It's expressed throughout the body, but is especially prevalent in the central nervous system. An excess number of CAG repeats in the HTT gene leads to the production of a mutated form of huntingtin protein. The characteristics of these mutated proteins cause them to be likely to be cleaved by cellular enzymes. The cleaved fragments then have a propensity to group together, forming clusters within neurons that are not easily removed by brain enzymes. It has been hypothesized that these protein clusters (which are similar in some ways to the protein aggregates seen in Alzheimer's, Parkinson's, and other neurodegenerative diseases) may play a role in the neuronal damage seen in HD. Watch this 2-Minute Neuroscience video to learn more about Huntington’s disease. Additionally, mutant huntingtin seems to also be able to recruit other, normal proteins, into these clusters. In this way, huntingtin protein is thought to spread its abnormal state to healthy proteins, which might cause normal cell functions to be disrupted. Finally, some have suggested that mutated huntingtin may also have direct toxic effects on neurons. As with other neurodegenerative diseases, however, the exact way HD leads to neurological damage is not fully understood, and the effect the protein aggregates have on the brain is still not completely clear. Some researchers, for example, have even argued that huntingtin aggregates are part of the brain's defense mechanism as it tries to cope with other pathogenic changes that are occurring. In general, though, the evidence supports the hypothesis that huntingtin aggregates are toxic and play some role in the progression of disease. As huntingtin protein deposits accumulate in the brain of an HD patient, areas of the brain also begin to display neurodegeneration. As mentioned above, the caudate and putamen are strongly affected, but other regions like the substantia nigra, cerebral cortex, hippocampus, cerebellum, hypothalamus, and thalamus experience degeneration as well. There is no cure for HD. There are a number of medications, however, that can be taken to treat the symptoms of the disease. These vary depending on the symptoms being targeted, and range from drugs liked tetrabenazine to treat chorea to selective serotonin reuptake inhibitors for depression. While drugs like tetrabenazine are effective in treating symptoms of HD, some also have significant side effects. This often leaves patients without great options for treatment. The sparsity of treatment options combined with the inevitably fatal nature of the disease contributes to the suicide rate being about 5 to 10 times higher in HD patients. Walker FO. Huntington's disease. Lancet. 2007 Jan 20;369(9557):218-28.